Following on from our exploration of Artists X Tableware, we thought it would be interesting to explore how artists are bringing something different to the world of restaurants. When we think of arty restaurants, we no doubt think of legendary institutions such as La Colombe d’or in Saint-Paul-de-Vence whose artist-patrons, including Picasso, Chagall and Matisse provided the works that fill the walls. Or perhaps the Kronenhalle in Zurich where diners can enjoy a meal surrounded by original works by Miro, Braque, Bonnard or Rodin. But here it’s a little more next-gen. We are going to take a look at restaurant collaborations with artists that rethink everything from the design and experience, right down to the food on your plate. One of the most famous examples of an artist-designed, and in this case owned, restaurant is of course Damien Hirst’s Pharmacy. The original was an art world phenomenon in the 1990’s with everyone from Madonna to David Bowie coming to sample the hallucinatory nature of walls covered in pills boxes and the subversive angst of the Brit Art movement in full force. This closed in 2003 and Hirst went on to sell the contents at auction for some serious money. Pharmacy 2 opened in 2016 alongside Hirst’s new gallery and shop and provides a similarly prozac-charged experience. Another London forerunner of the artist x restaurant collaboration is Sketch, opened in 2003 it is still running at full force with the Pope of french cuisine, Pierre Gagnaire, in the kitchen. Sketch has been named amongst the top restaurants in the world and the ‘Lecture Room’ holds two michelin stars. The Gallery restaurant presents a long-term installation by British artist David Shrigley. The latter also designed the tableware for Sketch, bringing his acerbically witty world to the dining table. Sketch is as much as art institution as it is an eatery and has hosted moving image exhibitions by international artists such as Carsten Nicolai and John Baldessari, along with creative workshops and even has its own shop. 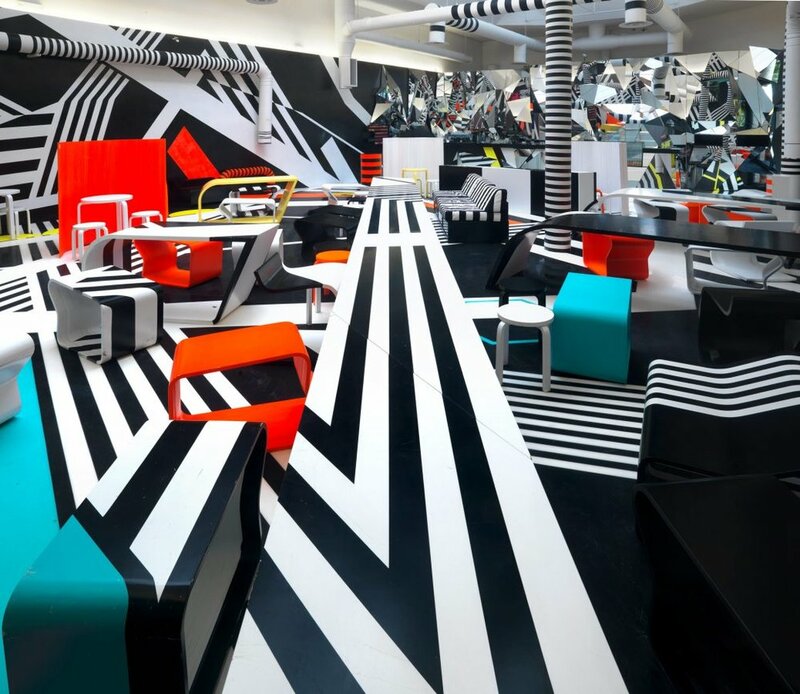 If you’re questioning the art world credentials of an art x restaurant collaboration, look no further than Tobias Rehberger who won the coveted Golden Lion Award at the 2009 Venice Biennale with his cafeteria-installation. The jury noted that the work went ‘beyond the white cube, where past modes of exhibition are reinvented and the work of art turns into a cafeteria. In this shift social communication becomes aesthetic practice.’ The installation revisited the 'Dazzle Camouflage' effect that was used during World War I to prevent the enemy locking in on a target. There has always been a close relationship between art and food. Indeed the still-life brought the table to the forefront of high art in the 16th and 17th century. Artists in the 19th and early 20th century would place café-culture at the heart of their creative universe and often used it as a reference in their work (think Picasso and Braque’s Cubist phase). In recent years we have seen artists get more involved in the ritual of eating and cooking as an experience in itself. This began in art large part in the 1990’s when artists such as Rirkrit Tiravanija brought the concept of social exchange as an artistic medium to the fore. In 1992, Tiravanija famously made a show at the 303 Gallery in New York called ‘Untitled’ (Free). It consisted of the artist serving free Thai food to visitors and was part performance/part installation. This work subsequently was acquired by the MOMA. In 2015, the artist opened a hybrid restaurant-gallery, UncleBrother, with his dealer Gavin Brown in up-state New York. The restaurant proposes pop-up exhibitions, guest chefs and aims to bring the local community together. In the words of Tiravanija, “I am always interested in this idea of bringing art closer to life. This space provided a way to make this economically feasible.” The artist is working on opening another venue in New York. A few thousand kilometres away in Japan, internationally reknowned artist Yoshimoto Nara teamed up with the Graf designers to create A to Z Café in Toyko. It’s a relaxed loft-like vibe where you can eat and enjoy great coffee and chillax with tea. Visitors can immerse themselves in the strange, childlike universe of Nara’s work through a small wooden house in the middle of the restaurant. Having visited this café, I confirm that there is truly is a relaxed and creative vibe with a great view over the rooftops of Omotesanda. Sometimes artists even get behind the stove. This is what happened with Zagreus Projekt in Berlin founded by the artist/gallerist/chef Ulrich Krauss over 10 years ago. Every two months an artist is invited to create an installation around a culinary project. Krauss explains “with every exhibition, we have a different point of view on food or on the situation of eating, and that is the most important thing.’ Past projects have included ‘The Silence Meal’ by Finnish artist Nina Backman, where diners eat the entire meal in silence, focusing only on the sensory experience and Yudi Noor’s Langhaus, a meal served within a traditional Indonesian wooden structure. We hope that you have enjoyed this brief overview, which has been designed to give you a taste for how art and artists can transform the dining experience which is so central in our daily lives. We owe it to ourselves to explore and push the boundaries as this is where the magic happens.